The Temple, Tiger and Tribe tour has been carefully designed by our agency for those travelers who have a deep interest in culture and wildlife. The tour begins in New Delhi , and we eventually go through some of the most beautiful monuments of Indian History. Our major part of the trip will spent in the state of Madhya Pradesh, one of the largest states of India. We then head to do a few game drives in some of the most fascinating wildlife parks in India , Bandhavgarh and Kanha National Park which finds its position in Rudyard Kipling’s famous novel: The Jungle Book. Our tour ends with visiting the friendly tribes of Chattisgarh and Odisha, where we will visit colorful weekly markets, beautiful landscapes and hike up to peaceful and tranquil villages. Our representative meets you at the Airport In Delhi . On arrival transfer to Hotel. In the evening you are free on your own to explore the city of Delhi. On arrival check into hotel . In the the afternoon visit Gwalior Fort.Medieval history has described it as shining pearl in the garland of Indian Forts. Different building styles from ancient to modern are encountered here. Built at a height of 700 metres on a hill and protected by tall ramparts and large towers, it was difficult to conquer. There are six gates that provide entry to the fort.Of all the palaces in the Gwalior Fort, Man Mandir Palace is the most beautiful. It is said that the walls were once covered in white plaster and the towers were glad with shining copper. Towers above the wall are decorated with blue tiles.In the evening, enjoy a sound and light show at the Man Mandir Palace.Overnight stay at hotel. Drive to Khajuraho – a world heritage site after the leisure filled breakfast. The drive is around 3 hours. On arrival check-in the hotel. Freshen up quickly and our guide will be at the hotel to show you the beautiful temples of Khajuraho also awarded as the world heritage site. In the evening enjoy the magical moments during the sound and light show at the temples of Khajuraho. Wake up early morning and enjoy the coffee/tea with the cookies served at the reception. Set out for the early morning jungle jeep safari in the national park and see the Tiger and other wild animals in their natural habitats. Come back at the hotel for the breakfast after the fours hours of jungle safari. Relax and enjoy the shower. Enjoy the lunch and once again move out deep inside the national park. wake up early in the morning to proceed for safari in the park. Later drive for kanha national park. Evening relax at hotel . 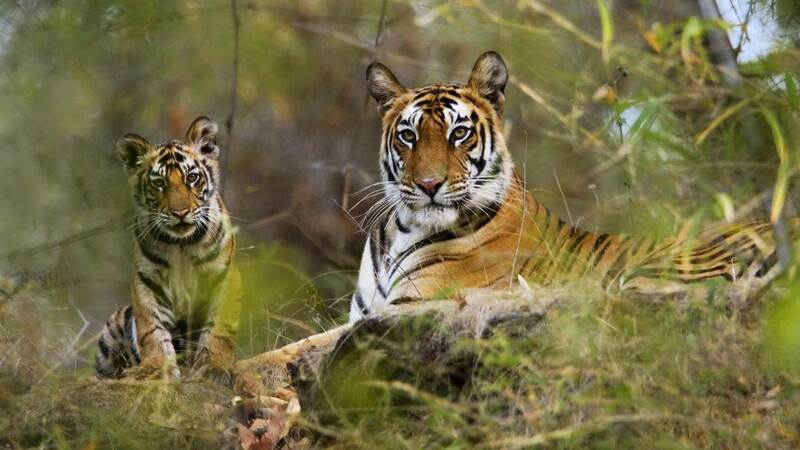 The jungles of kanha has inspired the famous writer Rudyard Kipling to write the book the Jungle book . Wake up early in the morning to do the morning safari return back to hotel to have lunch and relax. Later again proceed for the evening Safari. Overnight at Hotel. Early morning proceed for the final safari in the jungles of Central India at Kanha natioanal park. Later we drive to Bhoramdeo . We visit the famous weekly market of the Baigas in the Evening at Chilpi. Overnight at resort. In the morning we visit The baiga villages , the baigas also refereed to as the people of the Earth or the medicine men . The women have beautifully tattooed their faces and the houses are beautiful made with clay bricks. Later we come back to the hotel for lunch and in the afternoon we proceed to see the ancient temples of Bhoramdeo and finally a visit to the most interesting weekly market at Taregaon , considered to be one of the most colorful weekly markets of the Baiga tribes. Overnight at Bhoramdeo. After breakfast we proceed towards Kanker region of the Muria Gonds . The Murias are known for the Mixed dormintory system called as Gothuls in which young boys and girls stay together. Visit Muria gond villages. Further drive towards Kanker. Overnight at Kanker. Today we drive towards Jagdalpur , the center of the most colorful tribes of Chattisgarh and beautiful weekly markets . Each day there is a market at a different place , the tribes of these region the Maria Gonds visit these markets. En route visit the village of Kondagaon which is famous for metal craft. Later drive to Narayanpur weekly market which commences on Sundays. Overnight at Jagdalpur. After breakfast we visit villages of the Maria Gond , possible to see the traditional Bison Horn Maria gond Dance . Evening we visit the Most colorful weekly market at Tokapal , You can see the tribes coming down from the villages to buy items of daily use , local alcohol , a form of betting takes place with chicken fights as well. Overnight at jagdalpur. Morning drive to visit Chitrakoot falls , one of the most beautiful falls of India , later continue driving towards Jeypore . We stop at the textile village of Kotpad. In the evening you are free to take a walk in the busy baazar of Jeypore. Today we drive to Peta to our Camp Site , the valley is surrounded by beautiful quiet and tranquil villages of various tribes like Gadabbas , Parojas and the Pottery makers also known as the Kumbhars. The whole day is spent to interact and see the life style of the villages. Overnight at Jeypore. After breakfast we drive 75 kms to meet the Bondas and the Gadabas at Onkudelli Weekly market . Later drive to Vishakapatnam and stop at Vishnu temple. We drop you at the airport for Final Departure. Tribal Festivals that you might encounter: Visiting the tribes, you will come across many festivals that the tribes celebrate that compiles their cultural art, dance, markets and practices that are unique and wonderful. Make sure that you carry your passport, Visa and Photo ID cards on the tour. Try to learn about the route maps and transportation access well so that you are well informed if there is any emergency. Learn about the vegetation, eco system, insects and the diseases that might affect your health and also learn about the precautions and the remedial measures. Photography is permitted in tribal areas , however we recommend that you take permission of the people before you start clicking pictures. Make sure to wear clothes as per the climate so that you will protect yourself from the weather changes. The clothes should be in darker colors so that it doesn’t attract the animals. Try to learn basics of the tribal language that includes greetings and thank you so that you can interact well with them. Be well prepared and gain the needed knowledge of the tribal tour.